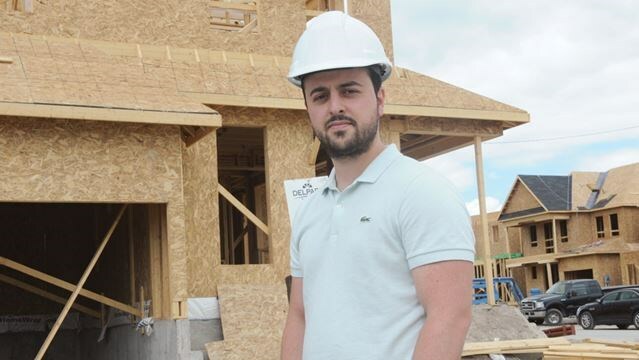 Nestled in the scenic rolling hills of Northumberland County, a new community is beginning to emerge. 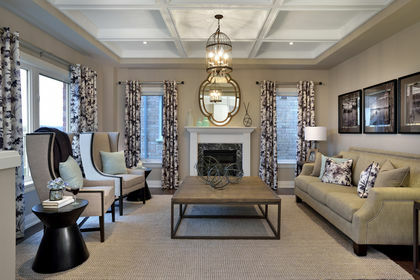 Hastings Estates, by Batavia Homes offers well designed homes at a great value. Located just 50 minutes away from Oshawa, living in Hasting Estates will put you close to the Trent River where you can walk to the municipality’s docking facilities. At the docks you can rent a slip for the day or for the season. Once you are out on the Trent, you can take whatever journey you choose. You can head to Lake Ontario to see the big city as you’ve never seen it before, or visit friends on Georgian Bay or spend a day exploring Rice Lake. The bridge over the Trent in Hastings is one of the few places in Ontario where you are allowed to fish off the bridge. At Hasting Estates, you will also be right next door to Prince Edward County - wine country, where you can tour wineries, sample the wines and discover a new favourite vintage. The neighbourhood is surrounded by golf courses, so you will have plenty of opportunities to perfect your swing. Schools are already in place, and you are just minutes from grocery stores, restaurants and more. The all brick homes are available on 44’ and 50’ lots with conservation and walkout lots available. The homes are on full municipal services including natural gas. For a limited time, homebuyers receive even more value, with a generous $10,000 cash back on some models. There are eight two-storey and bungalow designs to choose from, starting from just $189,900. The interiors are as elegant as they are functional, with open concept kitchens and great rooms with decorative columns. private ensuite with a separate shower and corner soaker tub. The Somerset (Elevation A) is an 1,800 square foot, two bedroom bungalow. This beautiful home features a two car garage, large covered front and back porch, main floor laundry with access to the garage, a separate dining room and a large great room. Cooking will be a pleasure in this kitchen, with a flush breakfast bar and bright dinette. The master bedroom has a walk-in closet and private ensuite with a corner soaker tub and separate shower. The second bedroom also has a walk-in closet and private ensuite. 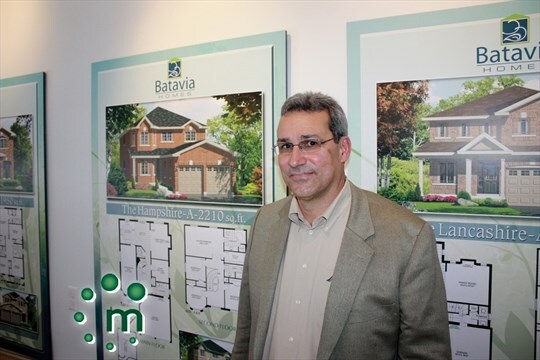 Batavia Homes boast a wealth of knowledge and experience with 25 years of experience in the new home community development. Founded on the principles of integrity and honesty, they are a proud member of the Tarion Warranty Program. You can be ensured that the care and attention to each and every home they build is as if it were their own. Batavia’s courteous customer service will be there before, during and after the purchase of your new home, ensuring you and your family peace of mind. The model home and sales office is located at 50 Church Street in Hastings. 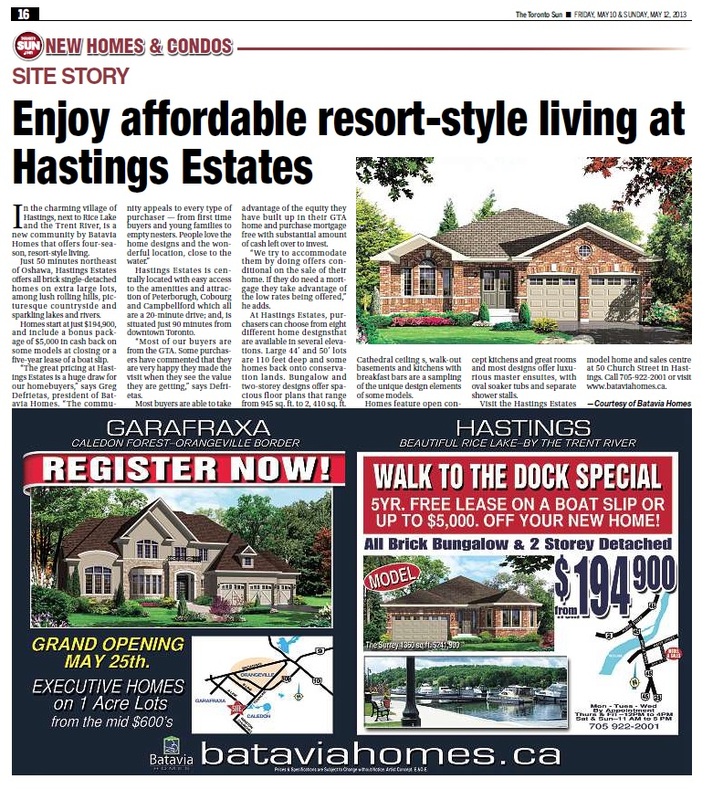 They are open Monday, Tuesday and Wednesday by appointment, Thursday and Friday from 12 p.m. to 4 p.m., and Saturday and Sunday from 11 a.m. to 5 p.m.
For more information, please call (705) 768-4441, email hastingssales@bataviahomes.ca or visit the website at www.bataviahomes.ca.